Thanks to Karen Ruane’s Simply Stitch 3 class that gave me the courage to cut that old lace! Absolutely gorgeous Mo, love the way you’ve used the lace! This one flew together all in one day, the lace is such a treasure! love seeing the different angles. it is gorgeous. do you have plans for the pages? 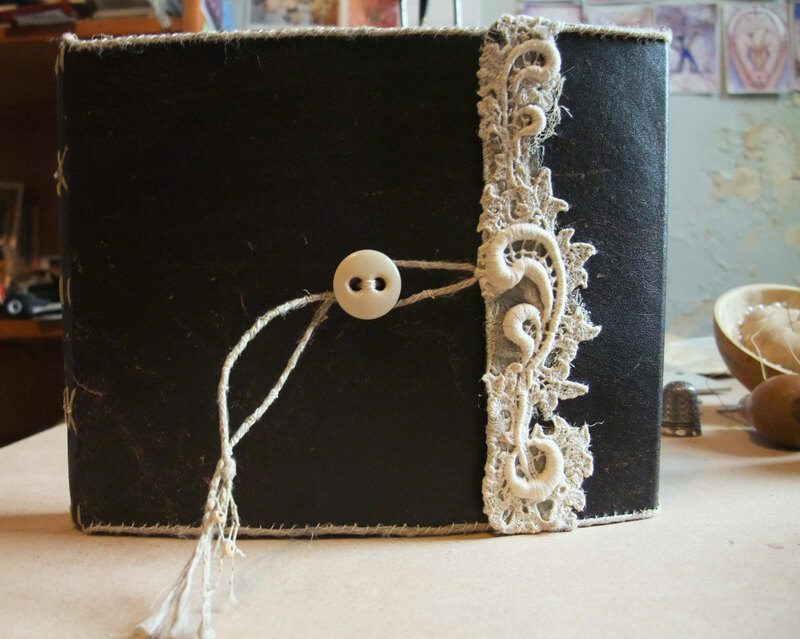 I left the pages blank as it’s for Renate who gave me the lace, leather and buttons, she has had such an amazing life I hope she writes it all down in this book! What a beautiful work of art! 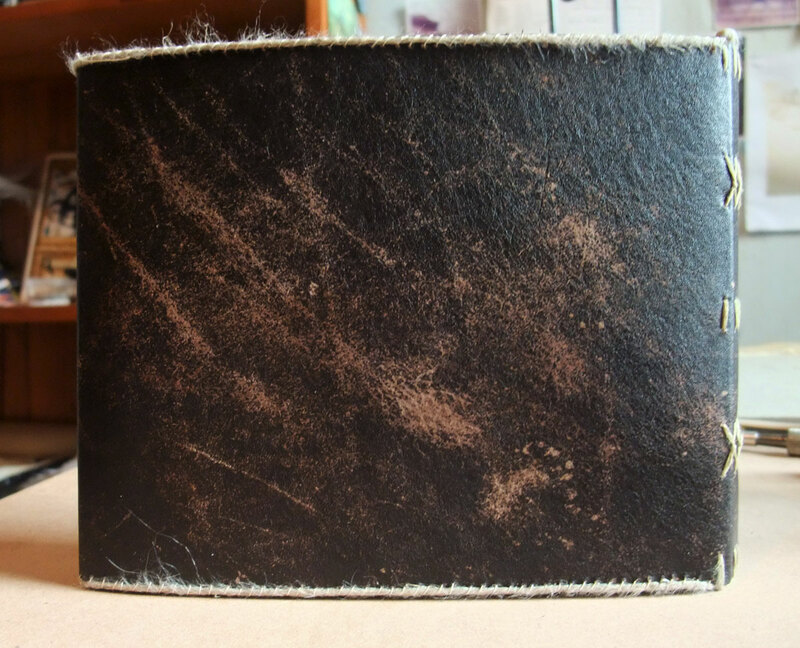 Love the inside of the cover too showing the stitching! I often like the reverse of embroideries & patchworks better than the front! Just gorgeous, Mo! You’re right, the lace is just amazing. 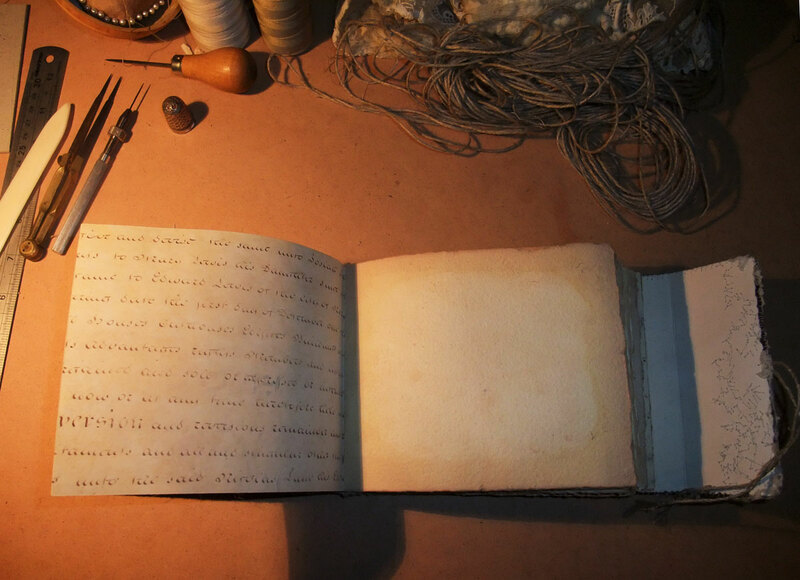 Lucky Renate, though after supplying such beautiful materials, she will doubly treasure your book! Renate had a second hand shop in Berlin in the 70’s she has some amazing treasures! really beautiful. i love the contrasts of leather and lace , dark and light . straight line and curved. Beautiful! I kept hearing the word “relic” when looking at it. Relic indeed! 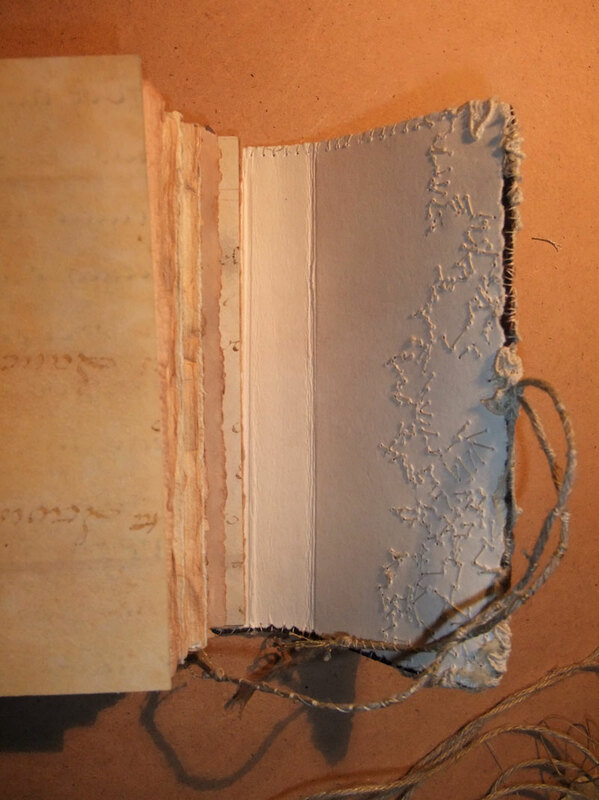 all the materials are so old, the parchment is so perfectly smooth like silk it will be a beautiful surface to paint on and the lace is heirloom quality. It was hard to cut both of these things as they reek of history but now that I have made the first cuts it’s easy! This piece allows the cutting up of the fancy hankies and table runners people have been giving me in this year of looking at lace! Velma Bolyard at wake robin at blogspot – ” i will be teaching three classes. the first will be at amazing and wonderful BEAUTIFUL SILKS in Melbourne”. Ha yes the Ronettes! I must hop over and read Velma’s blog! Your beautiful beads arrived today thank you lovely lady~! Ah crow tracks in the snow… the next crow drawing has crow tracks in the sand at the beach and am busily stitching crow feet into the crow scarf that I want to have finished enough to wear by Sunday for the opening of the Xmas Show! thanks, just found it anyway, as I saw the flyer for it on Facebook, I will try really hard to get there. Just beautiful, love the leather and lace and the stitching inside. be still my beating heart….this is divine…..happy to hear I gave you courage but the beauty belongs to you….. 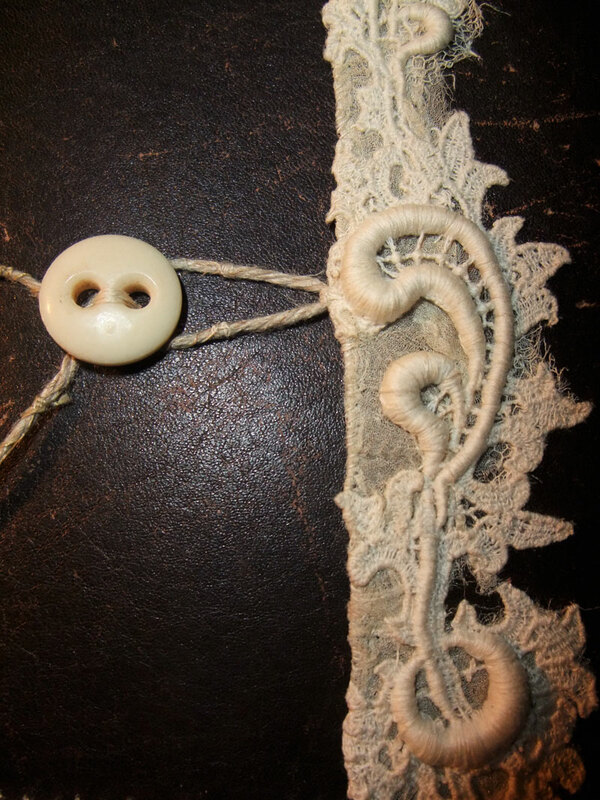 Thank you for sharing all the the amazing things you do with lace Karen! 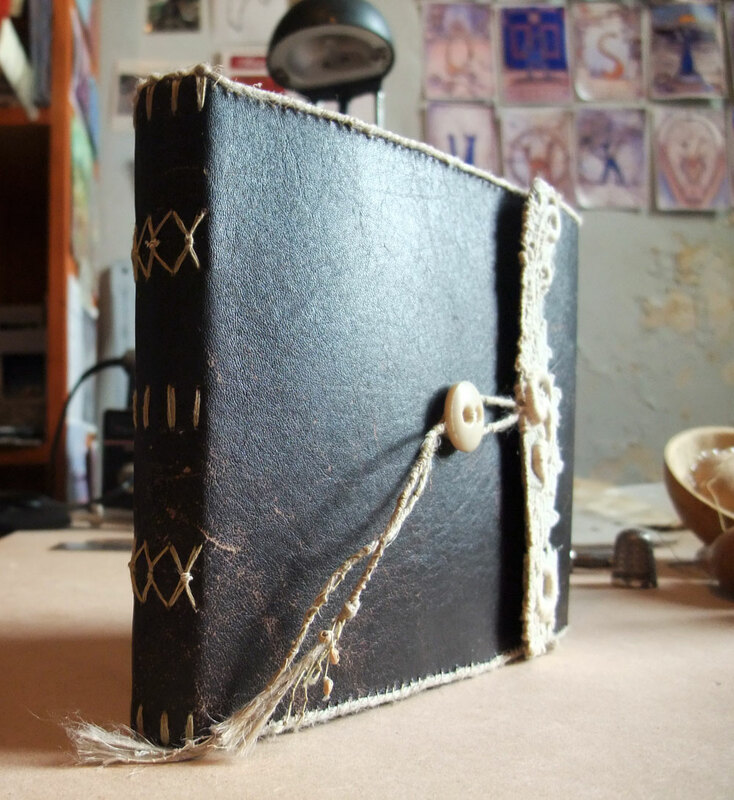 Mo, your book is so beautifully done that it makes me want to try more bookbinding. And that lace is to die for! I wish I could see the whole thing in person! The leather & lace work so well together! Renate bought the leather years ago to make a dress with that lace but never got around to it. She found the lace dress in Germany 40 years ago when she owned a second hand shop. The skirt between the lace panels was covered in sequins that she discovered were made of gelatin. It was very dusty so she soaked it in a cold bath but the sequins dissolved instantly, thank goodness the lace survived!! it is so great when something so ‘right’ comes together like this! love the reverse stitching of the lace — stars? crows’ feet? secret runes?